In Sync: Nuevasync has new features! If you don’t know what Nuevasync is, see my previous article for more information and how to get started using it. This just in! Nuevasync has just gotten better! Nuevasync has now released two of their most requested features, Selective Calendar Syncing , and multiple, separate calendars (which you can color code!). 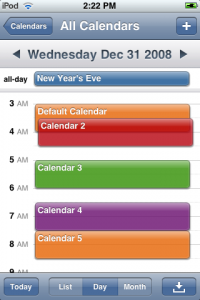 You can sync up to 8 separate calendars. You can now also sync read only calendars, like holiday calendars or anything else your given share only access to. Also, unlike using Exchange with Outlook, your secondary calendars can have alarms and reminders.